Born in Hiroshima, Japan, Sadako Sasaki was two years old when the atomic bomb was dropped on the city. When she was twelve, she contracted leukemia and was hospitalized. One of her roommates at the hospital told her about the Japanese belief that anyone who folds one thousand cranes would be granted a wish, so Sadako began folding cranes with the hope of recovering from her disease. Sadly, although she folded 1,300 cranes, she died on October 25, 1955. Children all over Japan were so moved by her struggle that they petitioned for and raised money to build the Children’s Peace Monument in her honor at the Hiroshima Peace Memorial Park in 1958. Symbolizing a cry for world peace, the monument is constantly surrounded by arrangements of origami cranes sent as tributes by people from all over the world. 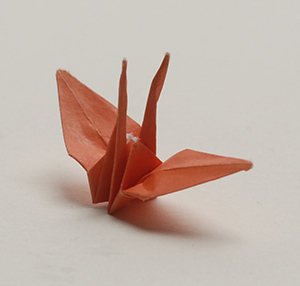 Today, thanks to Sadako and the children of Japan, the practice of folding cranes as a gesture of peace has become commonplace. Whenever a major disaster strikes anywhere in the world, cranes are folded and sent to victims as a symbol of hope and recovery. On May 29, 2016, an original origami crane folded by Sadako Sasaki prior to her death from leukemia in 1955 was donated to JANM by members of her family. JANM is proud to be the only West Coast site to receive one of Sadako’s cranes; we join a very small list of international venues to have one of these small but powerful symbols. They are: Hiroshima Peace Memorial Museum, 9/11 Tribute Center, USS Arizona Memorial, Harry S. Truman Library and Museum, and Austrian Study Centre for Peace and Conflict Resolution. In commemoration of the World War II atomic bombings of Hiroshima and Nagasaki, which occurred on August 6 and 9, 1945, respectively, we will feature Yoko Ono’s Imagine Peace Wish Tree. Participants can write down their personal wishes for peace on a piece of paper that they tie to the tree. At the end of the commemoration, the wishes will be collected and mailed to the Imagine Peace Tower in Iceland, Ono’s on-going art project, where wishes from around the world are collected and stored. Sadako’s Crane will also be on display near the Wish Tree during this period.